This week is the most stressful week for those of us in minor league baseball. You have to make sure you hit all your deadlines, and make sure everything works. Compounding the stress is waiting on the roster. In the minor league side of the spring training complex, there is a meeting room where all roster discussions are made. They literally have a board with every players name on it. The board is kept under lock and key (I’m serious). I am sure the next few night’s they will be biting their nails trying to make some extremely tough decisions. This has been a pretty eventful week though. Yesterday we learned that Brandon Maurer is the #4 starter in the Mariners rotation. The last time a Jackson pitcher jumped from Double-A to a major league rotation was Juan Cruz in 2001. That was when West Tenn was affiliated with the Chicago Cubs. Rather than doing a roster prediction with about 60% guessing, here is what seems pretty clear to me. Obviously there could be a sleeper jumping into a spot. Maybe a RHP Jordan Shipers, but one would think it would come from that group. As Mike Curto pointed out in his blog, Tacoma is a mess right now. But, in a good way. You Tacoma fans have waited patiently and finally get to see the future. But, could you wait a little longer? Maybe. Right now if RHP Jeremy Bonderman accepts a minor league assignment Tacoma’s rotation would have seven guys for five spots. (Jeremy Bonderman, Erasmo Ramirez, Danny Hultzen, James Paxton, DJ Mitchell, Andrew Carraway and throw in Hector Noesi) Paxton has struggled some this spring, but I don’t seem him coming back to Jackson. The back end of the games will be controlled by RHP Carson Smith. He has a great arm and could make a quick jump like Carter Capps did last year. Smith was in the 2011 draft class out of Texas State. RHP Jonathan Arias and RHP Stephen Kohlscheen should be top set-up guys. There is a chance you could see RHP Logan Bawcom back in Jackson as well. If he does, that would be an outstanding bullpen. It’s not Pryor and Capps, but that may never happen again. Also, expect to see Moises Hernandez (Felix’s older brother) in the pen. Catching is interesting too. 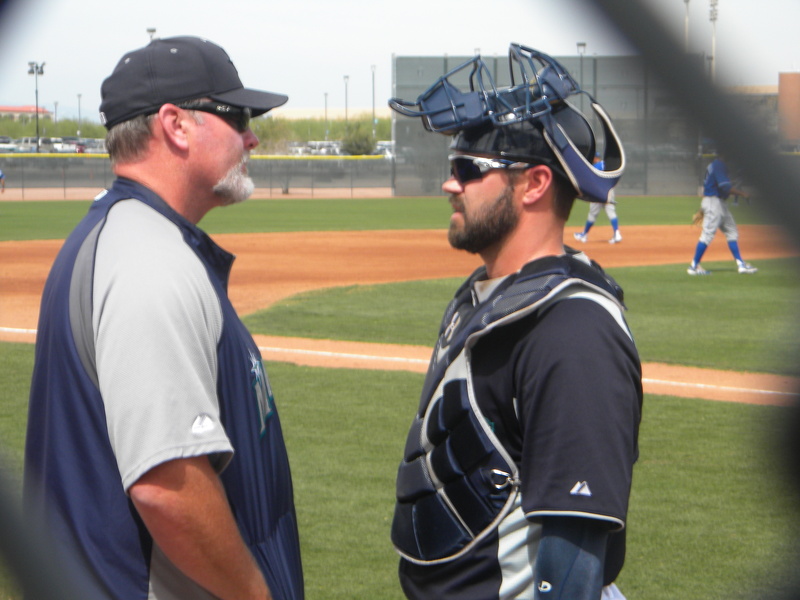 Eric Wedge confirmed yesterday that Mike Zunino would start in Tacoma. So, that leaves Brandon Bantz, Ronny Paulino and Jesus Sucre for one back-up spot. My bet is some trade partner out there is in need of a catcher. But, an excess of catching is a good problem to have. That leaves John Hicks to open the season as Jackson’s catcher. Generals fans disappointment in not seeing Zunino should be short lived. John Hicks has hit .312 over his first two pro seasons and stole 22 bases last year for High Desert. He has great speed for a catcher. There are rumors that Hicks could be moved to a different position, but he may be one of the best defensive catchers in the system. The outfield seems to be pretty clear. Some semblance of Francisco Martinez, Leon Landry, James Jones, Denny Almonte, Julio Morban and Abe Almonte will be in the outfield. The Jackson infield looks to be a mix of old and new with Brad Miller more than likely coming back as the shortstop. If Rich Poythress opens in Triple-A (which he should) expect to see Steven Proscia at third and maybe Dennis Raben or Joe Dunigan at first base. Jack Marder would be a solid bet at second base with Gabe Noriega a solid backup. Nate Tenbrink is a possible candidate as well, but he’s had a great spring and deserves a shot in Tacoma. So, that was basically me throwing paint at a wall. Hopefully it was as clear as mud. 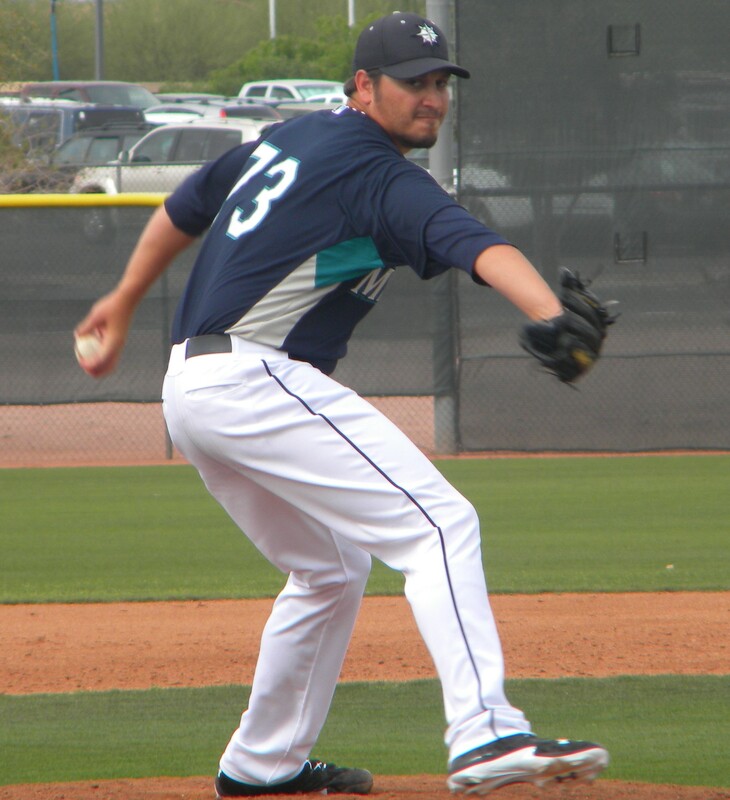 My trip this past week to the Mariners spring training home in Peoria, Arizona was quite beneficial in many respects. The Mariners have an 18-9 record this spring and some of it can be attributed to the play of members of the 2012 Generals. With that said, here are 10 things I learned this week. 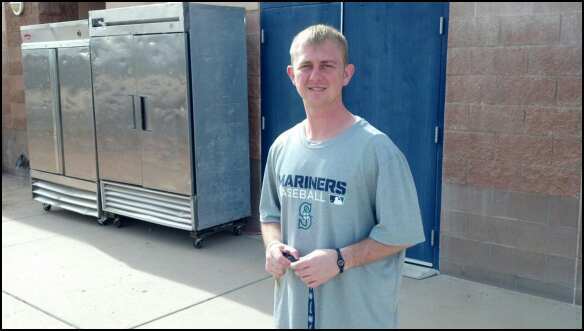 2012 Generals Brandon Maurer and Brad Miller are the talk of Mariners camp. The 2012 Southern League Pitcher of the Year, Brandon Maurer has a legit shot at one of the two open spots in Seattle’s rotation. Maurer out-dueled Giants’ lefty Barry Zito Tuesday night and is 2-1 with a 1.20 ERA in five spring outings, with 15 strikeouts in 15 innings. Infielder Brad Miller has two triples a home run and five RBI this spring. Miller had a big game Tuesday against the defending World Champion Giants and has played short stop, third base and even some second base. 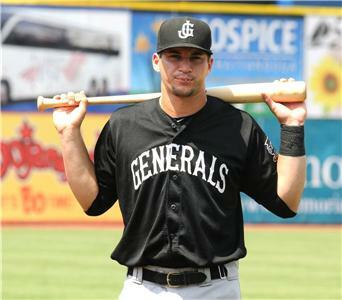 The 2012 Generals Minor League Heart and Soul Award winner is making a name for himself. Miller still could start the year in Jackson, but his time here could be short lived. There is so much pitching depth in the organization and it’s not just the big names like Paxton, Hultzen, Walker and Maurer. The Generals rotation this season could feature guys with major league experience like Hector Noesi and Chance Ruffin just because there is so much depth. Those guys plus prospects Taijuan Walker and James Paxton could end up in Jackson. Catching is just as deep as pitching. Catchers Mike Zunino, Ronny Paulino, Jesus Sucre and Brandon Bantz should be in Triple-A. But there just is not enough spots. Highly touted prospect John Hicks out of Virginia is expected to start for Jackson, but could that be put on hold, maybe. ­The potential Jackson outfield would be a good 4×400 meter relay team. There are seven guys fighting for those four or five spots, but they all can fly. Former LSU star Leon Landry leads the pack. He was a track and football star in high school and had he of wanted to play running back at LSU, he could’ve made a huge impact there. James James, Abe Almonte, Denny Almonte, Julio Morban, Daniel Carroll and newly turned centerfielder Francisco Martinez are top candidates. Mariners brass have a lot of tough decisions to make. Friday while taking in the big league clubs batting practice. Mariners’ GM Jack Zduriencik told me in passing “I’ve got to pay close attention right now, it’s so close with some of these guys”. Cuts have been postponed time and time again this spring because of the amount of depth at several positions all throughout the system. The big league club has a middle of the order now. Last year the Mariners were last in the AL in home runs. But, this spring with the additions of power hitters Michael Morse and Kendrys Morales that has changed. Those two have combined for 11 of the 48 team home runs this spring. It still amazes me watching games on the back fields. The six backfields of a spring training complex are like glorified high school fields. Chain link fences with metal bleachers, but perfectly manicured diamonds. Watching some of the best players in the world in that setting is pretty cool. Speaking of the complex, construction to begin when spring training ends. The Mariners share the Peoria Sports Complex with the San Diego Padres and on April 6, they will demolish the current clubhouses. The 10 month project will give both teams new state of the art weight rooms, training rooms, clubhouse facilities and office space. Former Generals will be seen and heard from this season in Jackson. I spent three hours Thursday collecting video and audio from former Generals like Dustin Ackley, Kyle Seager, Stephen Pryor, Tom Wilhelmsen, Brandon Maurer and Danny Hultzen. 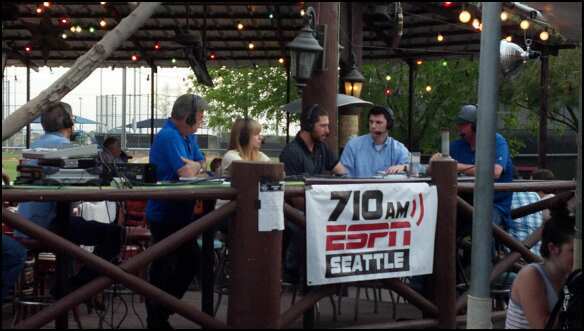 Even Mariners stars that didn’t play in Jackson such as Brendon Ryan, Michael Morse and Justin Smoak recorded radio promos you will hear all season long. It’s all still Felix’s world. Not only is Felix Hernandez a tremendous pitcher, he is a doubly better human being. You can just see it in the way he treats everyone from the clubhouse crew to parking lot attendants. The former Cy Young award winner fed over 200 minor league staffers and players last week Famous Dave’s barbecue. With this new contract he can more than afford it, but he didn’t have to do it. He is the only player in the Mariners clubhouse that uses two lockers. But, if anyone has earned it, Felix has. Today is the final day in paradise before heading back to Jackson (the real world) tomorrow morning. The flight departs at 6:25 a.m. this morning. I’m expecting to see a little snow one the ground when we land in Nashville. Today was spent mostly shooting promos that will appear on the Generals’ video board during the season. Also I collected radio promos and liners from Mariners players. Ended up walking over to the backfields to watch some minor league games as too. With it being the first day of the NCAA tournament, most of the attention in the Mariners complex was focused on the madness. 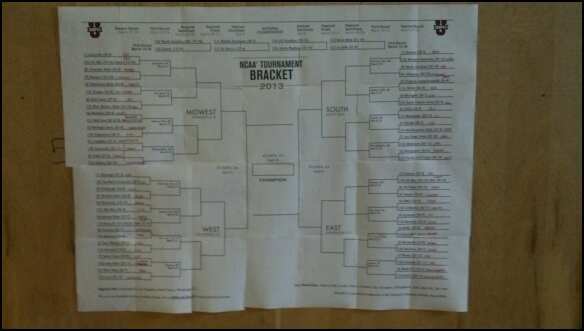 If you didn’t see it on the Mariners official blog the other day, there is a huge bracket in the Mariners clubhouse. There is a Mariners staffer or player assigned to each team. It was hard to focus on working from 12-2 p.m. while my Memphis Tigers were playing. (By the way Dustin Ackley has them in the pool) But, while recording promos with players Brendon Ryan kept me posted on the score every time I stepped back inside. The AAA and AA clubs were on the road in Surprise at the Rangers and the A- and A+ clubs were at home against the Rangers. In the AAA game Tacoma lost to Round 3-1. Tacoma had to face potential Rangers opening day starter Matt Harrison Thursday, who was getting some work in on the back fields. In 6.0 IP he allowed just 3 hits and struck out 9. For Tacoma, Chance Ruffin (90-92) gave up single runs in the 2nd and 4th on a SAC fly and 2-out RBI. Stephen Kohlscheen tossed 2.0 shutout innings after Ruffin. Yoervis Medina (94-95) worked a scoreless inning and Jonathan Arias (92-95) allowed a run in 2.0 innings. James Jones was 1-for-3 and Vinnie Catricala was 1-for-2. Jackson beat Frisco 6-4 and it looked like Jack Marder and Ji-Man Choi and nice games, but I don’t have their stats. On that back fields in Peoria, Oliver Perez, Lucas Luetge and Carter Capps got some work in for the High Desert squad. Tyler Pike, the 19-year-old 3rd round pick last season pitched at the end. Thursday night the Mariners optioned OF Carlos Peguero to Tacoma and re-assigned P Carson Smith and INF Nick Franklin to minor league camp. That leaves the Mariners major league roster at 34 players. Many, many tough decisions still to come. It was great catching up with several former Generals and getting them to read promos for our video board and radio. Guys that participated included Dustin Ackley, Kyle Seager, Tom Wilhelmsen, Brandon Maurer, Danny Hultzen and Stephen Pryor. Guys such as Justin Smoak, Brendon Ryan, Michael Morse, Blake Beaven and even voice of the Mariners Rick Rizzs cut some promos. After being around Rizzs for the last few days, I am just blown away with how good he is at what he does. Plus he has a voice from God. 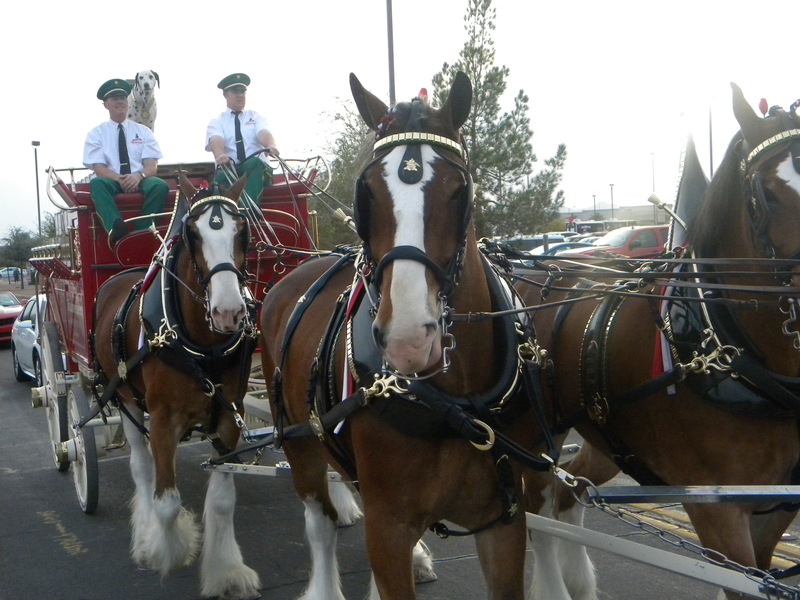 Growing up a St. Louis Cardinals fan, seeing the Clydesdales was always a thrill. They were at the Peoria Sports Complex tonight. Jackson home clubhouse manager C.J. Fedewa is part of the clubhouse crew here in Arizona. He works 16 hour days and stopped for a second to pose for a picture. While recording a promo about upcoming promotions at the ballpark Brandon Maurer was struggling a bit. He said “Dang it, I’m better than this” That’s the only thing Maurer has struggled with this spring. There will definitely be an outtakes reel from today’s recording session. Our video whiz kid back in Jackson Bradley Field will have a blast with it. With this being my final dayin Arizona I want to publicly thank the Mariners for their gracious hospitality. Everyone in the organization has been fantastic. We are truly fortunate to be a part of such a great organization. 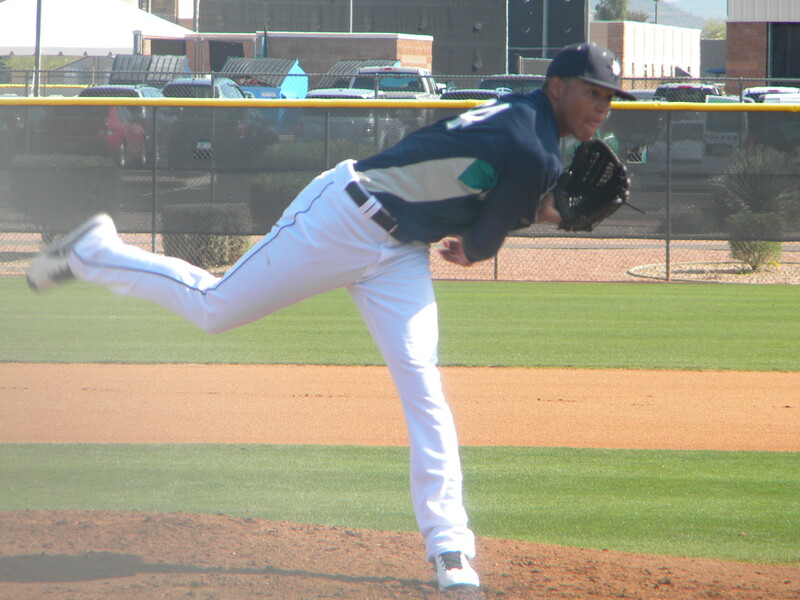 Interview with Taijuan Walker from Tuesday after his outing in an intrasquad game. He talks about how he feels this spring and his reaction to being sent down to minor league camp. Today was an off day for the major league club so most of the attention was on the minor league back fields. 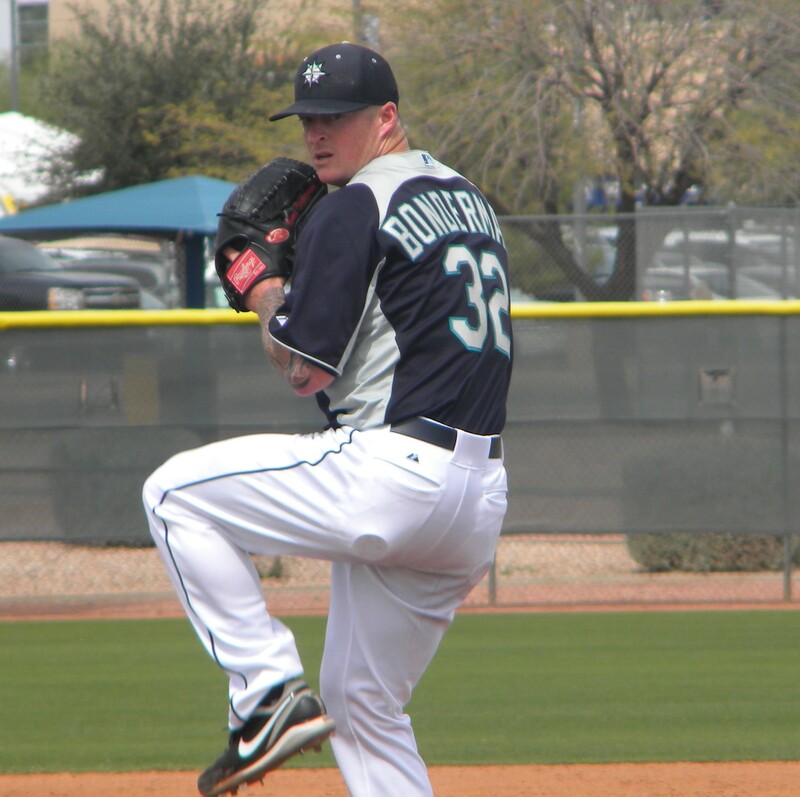 Jeremy Bonderman pitched for the AAA Tacoma club against the Royals AAA affiliate, Omaha. When a big league pitcher makes a start on the minor league side, a big league catcher comes along with him. Today it was Kelly Shoppach. Tacoma defeated Omaha 6-3 in what ended up being a 9 ½ inning game. These minor league games are run with no scoreboard and really no format. Some innings can go five or six outs. Or, Kansas City has a rule that no pitcher can throw more than 20 pitches in a single inning. Bonderman, according to my scorecard pitched 6.2 innings and threw 76 pitches. He allowed one run on five hits and struck out 4. He also hit a batter. He finished his outing allowing three straight hits, but reached his pitch limit. He had an 80 pitch limit in the outing. He really dominated until those last three hitters. Kelly Shopach made the most of his time on the back fields blasting a 2-run home run and hitting a 2-run double. Shoppach also provided one of the quotes of the day below. Of note, Bobby LaFromboise and Moises Hernandez each allowed a hit, but pitched scoreless innings. Brian Sweeney entered the game following Bonderman and allowed two runs in his first inning of work. Their honestly was not a lot of offense outside of Shopach in the AAA game. The Royals pitching was impressive against anyone other than Shoppach. Their starter 6 foot 5 Will Smith (not that Will Smith) struck out seven in five innings of work. Lefty Chris Dwyer was filthy later in the game and struck out three in 2.0 innings. He featured a 12 to 6 curve ball that had some pretty incredible bite. Rich Poythress entered the game in the 6th inning and belted a ground rule double down the right field line. Rich is in great shape and seems to be swinging the bat really well. James Jones continues to impress offensively and defensively. The former 4th round pick in 2009 beat out a routine ground ball to short and also stole 2nd base easily. He also has two outfield assists the last three days. 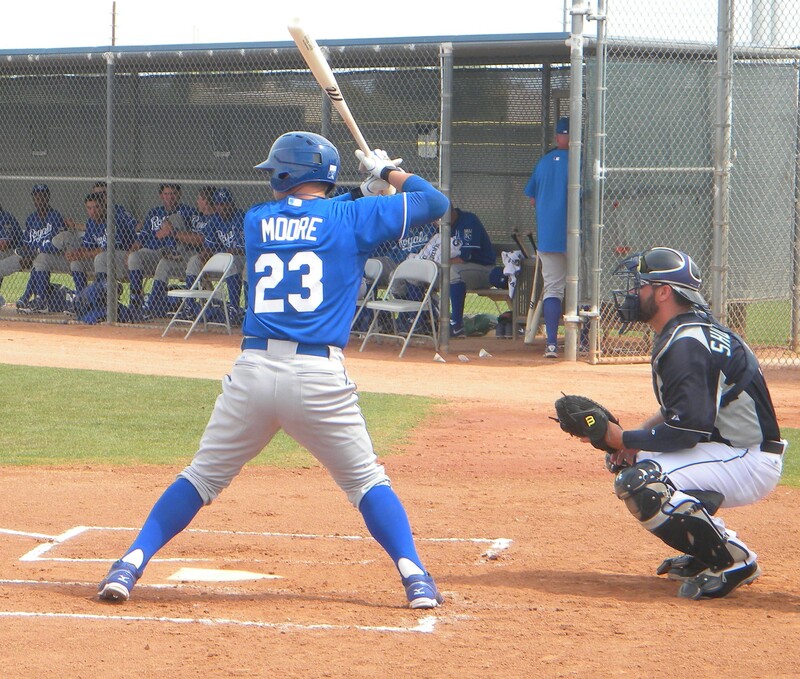 Adam Moore played for the Royals AAA group on Wednesday. The former Jackson and Mariners catcher went 1-for-4 with a double against Bonderman and also scored a run. I caught up with Adam after the game and he said he felt like he would start the year in AAA Omaha. Minor League Operations Assistant Casey Brett said the potential four-man outfield Jackson could have is being called around camp the 4×400 meter relay guys. (Jones, Leon Landry, Daniel Carroll and Abe Almonte) At one point in the AAA game, Julio Morban, Jones and Landry were in the outfield. Those guys can cover some ground. The AA Mariners took on the Royals AA guys on another backfield Wednesday. I don’t know the final score, but 2012 Generals opening day starter Andrew Carraway pitched 4.0 scoreless innings and allowed just one hit. Also in the game, catcher Steve Baron blasted a 3-run home run. The Kansas City Royals had a training table with them on their short trip from Surprise. It was very unique to see guys getting worked on underneath a shade tree in the middle of the back fields. If there is a position on the field you would like to have too much of, it’s catching…Okay, maybe you can argue pitching, but right now the Mariners have an abundance. Right now it seems this is the pecking order of catchers in the organization. From Sucre on down, those guys should be in AAA or AA, but there just isn’t enough spots. It provides as many tough decisions as pitching does. OF Eric Thames, C Mike Zunino and RHP Logan Bowcom were re-assigned to minor league camp Wednesday. None of which were involved in the minor league games. Those moves bring the number of players in major league camp to 37. Joe Dunigan and Stefen Romero are both suffering from oblique injuries. Both have a chance of beginning the season on the DL. Once spring training ends officially, they will begin dismantling the current clubhouse/offices on both the Padres and Mariners side. The facility is 20 years old and upgrades are necessary. The project is scheduled to take 10 months and be ready for the opening of camp in 2014. Not only are the Generals taking over on the field here in Peoria. I’ve been joined by Generals’ owners Reese Smith and David Freeman, as well as General Manager Jason Compton. Jackson home clubhouse manager C.J. Fedewa has been here since Friday working in the clubhouse. During last night’s Giants/Mariners game I was fortunate enough to join Mariners broadcaster Rick Rizzs on the Mariners radio network while Aaron Goldsmith did some TV. It was quite special that 2012 Generals Brandon Maurer, Brad Miller and Nick Franklin had big nights. Tomorrow the AAA and AA squads make a road trip to play the Rangers in Surprise while the A- and A+ teams will stay at home to play the Rangers. I will probably check out the lower level guys for a while then make my way over to the big league side. Tomorrow we will be cutting some promos and liners from former Jackson players that will be seen on the Jackson ballpark video board and audio heard on 96.5 ESPN during the season. 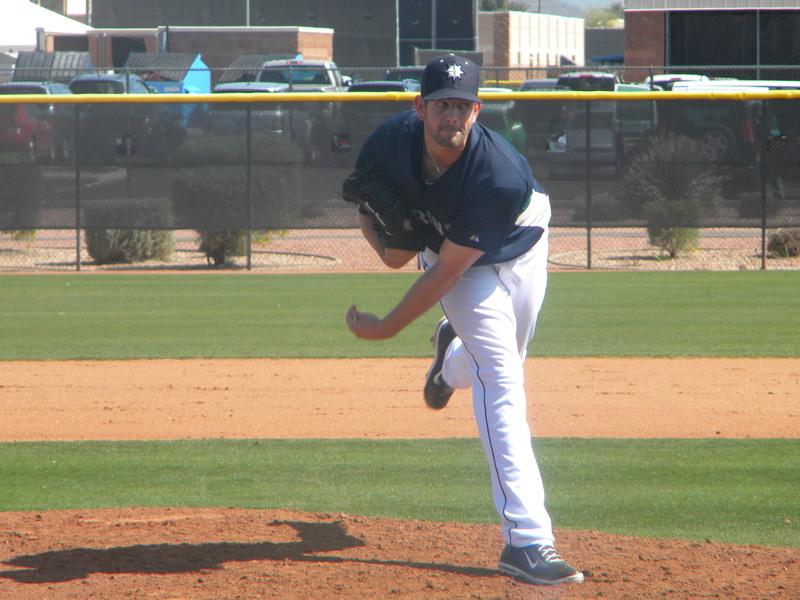 Tomorrow night at 7, the Mariners host the Chicago Cubs at the Peoria Sports Complex with Jon Garland scheduled to start. Erasmo Ramirez is scheduled to pitch after Garland. Starting for the Cubs is Jeff Samardzija. It’s expected to be another capacity crowd. 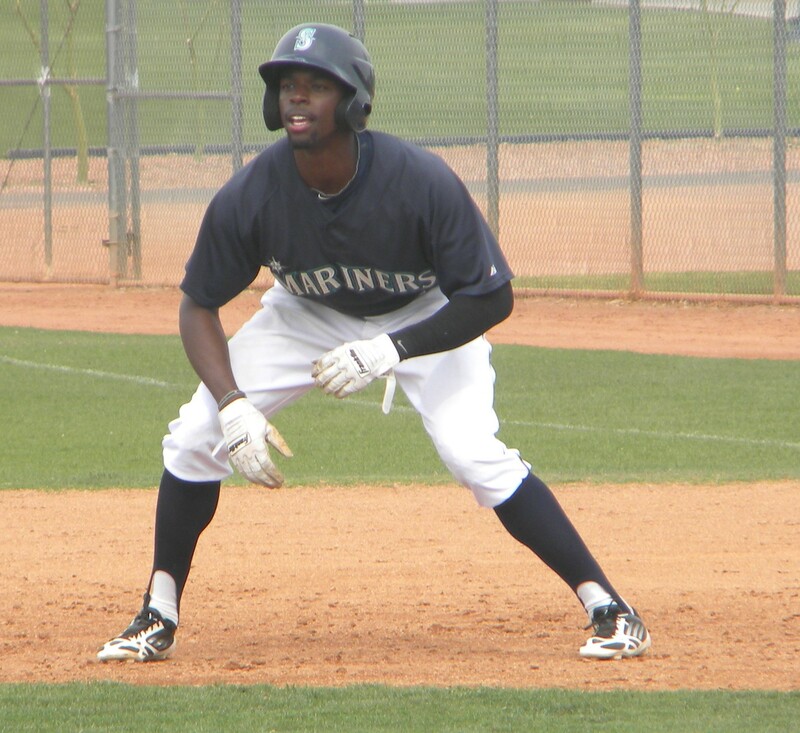 This morning at 10am the Mariners minor leaguers had two intrasquad games on the back fields. A- took on A+ and AA took on AAA. Below in the picture gallery you can see both lineups and who participated. There was a bigger crowd than usual for a minor league game and it was partly because of the big league team playing at night and Joe Saunders pitched for AA and Jesus Montero caught for AA. Taijuan Walker started opposite Saunders for the AAA side. Jackson won the game 4-2. Amongst those in attendance were GM Jack Zduriencik, Manager Eric Wedge, Amateur Scouting Director Tom McNamara, broadcasters Rick Rizzs and Shannon Drayer. Saunders pitched in the minor league game in order to stay on normal rest. He threw 78 pitches in 6 innings, allowing 2 runs on 8 hits, with 2 walks and 8 strikeouts. 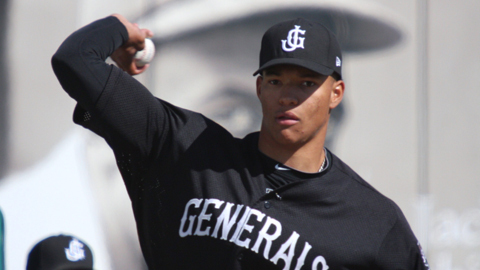 Taijuan Walker started for the AAA club and was solid. He allowed 1 run on 1 hit in 3.0 IP, walking none and striking out 5. He faced Jesus Montero twice and got him to ground out and strike out looking. The only run he allowed was a solo home run to young speedster Jabari Blash. Taijuan mixed his pitches well and was 92-96 with his fastball. His curveball has great bite and struck out 3 hitters. James Paxton came in for the next 3 innings and struggled a bit. In 3.0 IP he allowed 1 run on 4 hits, walking none and striking out 3. He did throw 3 wild pitches and plunked a batter. Paxton has struggled with command this spring leading some to believe he might be hurt, but he says he is okay. 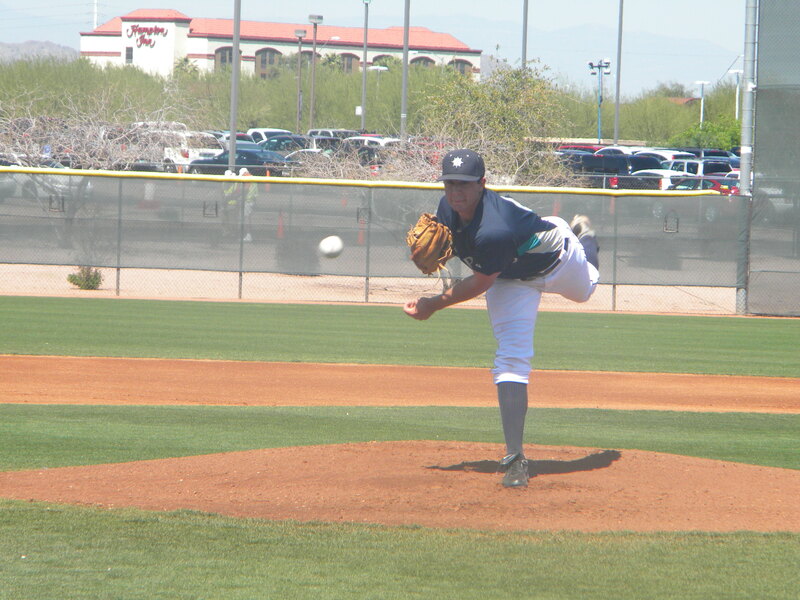 Brian Moran pitched a scoreless inning for the Tacoma club and struck out 1. He continues to pitch well. Tyler Burgoon pitched 3 innings for the AA group and while I didn’t see his line, he seemed to pitch really well. Denny Almonte had an RBI triple against Joe Saunders in the 2nd inning and picked up where he left off the day before. Almonte blasted a homer Monday against the Padres AAA. John Hicks had the highlight of the day in the 8th inning with an inside the park home run to center. Francisco Martinez got burned on the line drive and stumbled a bit. Hicks showed his great speed and circled the bases for a 2-run inside the park homer for the AA crew. Julio Morban after lighting the world on fire came back to earth a bit Tuesday, striking out 3 times against Joe Saunders. Scott Savastano quietly had a couple of singles in the game. Young 21-year-old prospect Ji-Man Choi, injured himself on a ground out running over the first base bag. It appeared like he twisted his ankle. Hopefully he is okay. The kid has a world of potential. After the intrasquad games today, Felix Hernandez bought a huge spread of food for the minor league side. It was quickly named Felix’s Fiesta. He catered Famous Dave’s BBQ and spent who knows how much on it. But, hey with that new contract, he can afford it. In the afternoon I took a chance to walk through the big league clubhouse and catch up with some former Jackson guys. Pretty crazy walking into a major league clubhouse and recognizing so many faces. I’ll be putting together some promos with former players that will run on Generals’ radio broadcasts and on the video board this season. This afternoon I’m hoping to catch big league batting practice and then settle in for the game tonight. It will be a lot of fun seeing Brandon Maurer face off against Barry Zito under the lights. Maurer by the way has this goatee thing going right now. Just a heads up if you watch the game tonight. Hello from the valley of the sun. The high today was 88 and my face is burning. Sorry, just had to rub it in a bit. I flew into Phoenix Sunday night from Nashville and since I took the cheap flight on Southwest, I arrived around midnight. After sleeping in a bit Monday morning, I headed over to pick up my credentials and say hello to everyone in the Mariners administrative office. After a quick walk through the complex it was off to the backfields to watch the AAA team (which I named TaJackson or Jackoma because it is a mix of players that will open the season in either Jackson or Tacoma) took on the Padres AAA team. One of the many cool things about spring training is the backfields and how there are four games going on at the same time. You sit on metal bleachers and watch some of the best players in the world play on a field with chain link fences. Pretty amazing. The Mariners bunch won the game 6-3 in a 9-inning game. Danny Hultzen started and was terrific. Hultzen has battled a hip injury this spring, but he showed no signs of discomfort. He tossed 3 scoreless innings, allowing one hit, walking none and striking out 4. One interesting note was that he faced Carlos Quentin in every inning which was his only hit, a single in the third. He was rehabbing a knee injury. Quentin had at-bats in each of the first 5 innings and was 2-for-5 with a homer. James Paxton and Taijuan Walker charted pitches and said he was constantly 90-94 with the fastball. His curveball had plenty of bite and he used it to fan 2 of his 4 K’s on the day. The amazing pitching stat of the day was no walks. That makes every pitching coach smile. Francisco Martinez led off and was 3-for-3 with a triple and RBI. Martinez has picked up right where he left off in big league camp. His triple was in the right-center gap. Denny Almonte and Carlton Tanabe homered in the game. Almonte’s HR was from the right side of the plate. Tanabe, a 21 year old kid backed up Brandon Bantz and gunned out a runner at 2b and had the homer in the 8th inning. You can really tell everyone pulls for the kid and his a clubhouse favorite. He seems like an outstanding young man. The Padres committed 3 errors in the third and poor Jose DePaula had to of thrown 50 pitches as the M’s AAA batted around and scored 5 of their 6 runs. Leon Landry and James Jones. Enough said. Landry beat out a routine ground ball to second base for an infield single. Jones subbed late and didn’t have a hit but watching them fly around the outfield is something to behold. Could very well be outfield partners in Jackson. In spring training its always interesting to see what assignments are given for non-players. Usually you have guys that shag fly balls and are bat boys. Today, Taylor Stanton was the bat boy and Brian Moran was the ball boy. Stanton made sure to tell me which one was which. It’s not often I get to sit back and watch a live radio show, so we took the opportunity to catch some former Jackson guys being interviewed by Rick Rizzs, Shannon Drayer and Aaron Goldsmith. The show was live at the Salty Senorita which is right beside the complex. Former Jackson guys, Dustin Ackley, Kyle Seager, Nick Franklin and Brad Miller. Miller was probably the most talked about player hitter today when I was asked about Jackson guys. He had a triple today in the big league game against Oakland and is becoming hard to keep off the field. Once the AAA game ended I walked over to the AA field to check out the final inning. As I walked up there was a 3-run home run hit. I asked one of the pitchers charting who that was, he replied: “I don’t know, some Latin guy” So you know it’s not only fans and media confused on who that 3rd number 12 is on your 146 player roster. After some research it was Abraham Almonte. Mystery solved. Tomorrow the minor league side have what is called a camp day. Low-A will intrasquad High-A while AAA will intersquad AA. Taijuan Walker and James Paxton are expected to throw tomorrow back-to-back for the AAA squad. The big league club will play their first night game of the spring schedule taking on the Giants at the stadium. 2013 Southern League Pitcher of the Year Brandon Maurer will start for the Mariners opposite Barry Zito for San Francisco. Maurer has been nothing short of phenomenal this spring posting a 2-1 record and a 0.90 ERA in 4 games.